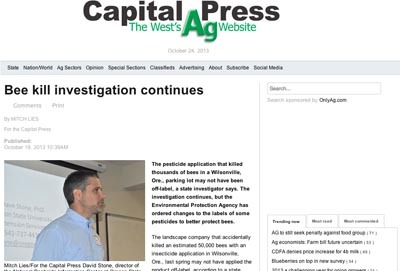 Here is a link to a very discouraging article, Bee Kill Investigation Continues, but it is also a very cautionary tale. The bumblebee kill in Oregon, estimated at 50,000, most likely eliminated nearly every bumblebee colony within flight range and it could take years to re-establish that population. There are two kinds of wording on labels, advisory and imperative. Advisory language is just that, advice, with no force of law. Imperative language is imperative. It is the “thou shalts” and it does have the force of law. The bulk of the label changes are in advisory language, but at the few points where imperative language is used the EPA goes to great length offering a long list of exceptions under which the label can be disregarded. Worse, the EPA clearly runs away from the challenge before it, focusing solely on foliar applications to bloom. It does little to increase the safety or avoid bee kills by suggesting that applicatioins be made after sunset or when it is too cold for bees to be flying when the insecticide may have a residual effect of days, weeks or months. There were bee kills on Linden trees in other Oregon towns where the spraying had been done months before. The purpose of the label changes, purportedly, was to address the new family of systemic pesticides, the neonicotinoids. and yet their mode of action – long term toxicity – is completely avoided in the label changes. After a good start, in which several of the neonics were temporarily banned, Oregon authorities appear to be bending to chemical industry pressure. 35 years ago aerial applicators in Boulder County would claim that they were following label directions on corn, for example, because they checked the corn at 4:30 in the morning and saw no bees, knowing full well that by 10:00 A.M. the field they had just sprayed would be full of foraging bees. Oregon Department of Agriculture inspector Mike Odenthal appears to be caving in to the same ridiculous reasoning.